It’s amazing to learn that discoveries of underwater pyramids have emerged all over the world—from Bimini to the Azores, to even Japan. Thanks to Google Earth searches, we can delve into the ocean depths to find hidden treasures that have eluded us for over 10,000 years and wonder at the ancient civilizations that once inhabited these mammoth structures. Do they belong to the legendary Atlantis or Mu that Plato talked about having existed many millennia ago? The Bermuda Triangle is a mysterious, unworldly, and sometimes deadly place on earth that has had scientists scratching their heads for decades. Ship, planes and boats have all gone missing without a trace—some reporting electromagnetic disturbances just prior to losing radio contact. In 2012, oceanographer Dr. Verlag Meyer, using sonar technology, discovered a crystal-like structure off the coast of Bimini that is three times the size of the Great Pyramid in Egypt. The length of the base reaches 300 meters, is 200 meters high, and has a 100 meter distance above the seabed from the base to the top. On the top of the pyramid are two very large holes. Water moves at high speeds through one of the holes causing waves to roll by, forming a giant vortex. This causes a massive surge of waves and mist on the surface of the ocean. Scientists wonder if this vortex effect might explain the strange electromagnetic anomalies that have been reported in the area since the 19th Century. When the crystal pyramid was first discovered, it was dismissed as “unsubstantiated” by Snopes, but several years later both French and U.S. diving teams independently confirmed the findings. Each concluded the structure is not a natural phenomenon, but man-made. You would think that scientists would flock to the site to learn more, but strangely enough this has not been the case. The story goes back even further. The crystal pyramid was initially identified by Arizona naturopath Dr. Ray Brown in 1970. 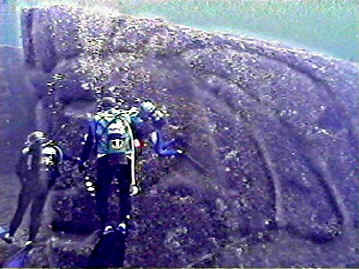 He reports that he came upon the structure while scuba diving in the Bari region of the Bahamas. He investigated the structure and was amazed that the sides of the pyramid were completely smooth and the joints between the individual blocks were almost invisible. He swam around the pyramid, until he finally found the entrance. Upon entering, Brown was further astounded by the clean, smooth sides of the interior—no algae or coral grew on the walls, even though it was totally submerged. Inside, he was fascinated by the various structures and items he saw. He found his way to a small rectangular room with a ceiling in the shape of a pyramid. The room was well-lit, with no visible external or internal light source. At one point he attempted to remove a multi-faceted red gemstone attached to a metallic rod that descended from the center of the ceiling but was unable to dislodge it. About four feet below the point of the gemstone, he saw a bronze sculpture of two open hands. Resting in the open hands was the now famous crystal sphere that he was able to take from its resting place. 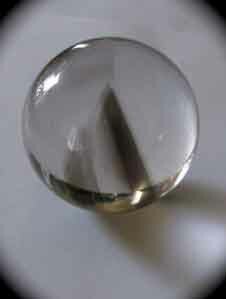 Four inches in diameter, Brown was surprised that he could lift the crystal sphere easily. The crystal sphere exhibits strange phenomena. Inside can be seen three pyramid images, one before the other. Those who have a well-developed sixth sense, have detected a fourth pyramid, just before the other three. When watching it from different sides, the internal pyramidal images dissolve into thousands of tiny fracture lines. Brown thought that these could be of an electronic nature, as are today’s integrated circuits. When certain metals come in contact with the sphere, they are temporarily magnetized. Compass needles spin counter-clockwise, while other objects are magnetically repelled (see Dr. Brown video below). Could this be the discovery American psychic, Edgar Cayce, predicted would be found after 1968 off the coast of Bimini showing evidence of Atlantis? 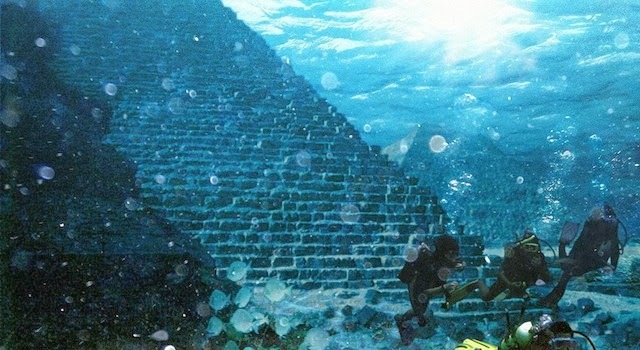 In yet another part of the world, on an island that lies near the southern tip of Japan’s Ryukyu archipelago, about 75 miles off the eastern coast of Taiwan, is another strange underwater pyramid called Yonaguni Jima. 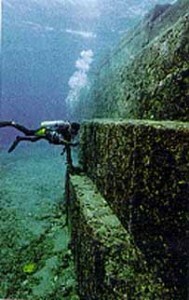 A local diver first noticed the Yonaguni formations in 1986. While looking to view hammerhead sharks, he strayed into an area where he saw a massive stone structure approximately 240 feet long and 90 feet wide, with monolithic blocks and huge high steps. The discovery caught the attention of researcher, Professor Masaaki Kimura, who mapped out the area in what he believes are the remains of a 5,000 year old city containing ten structures. The discovery included a sphinx-like structure, five temples, a large stadium and all this is complete with connected roads and water channels surrounded by huge retaining walls. Kimura suggested that the over-size steps were indicative of a race of “giants.” Whoever built these structures was certainly of an advanced intelligence. The exploration and discoveries are ongoing (video below). 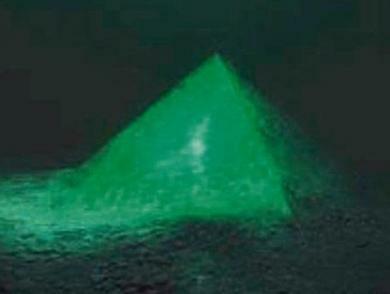 Another large underwater pyramid was found between the islands of São Miguel and Terceira in the Azores of Portugal. The structure is said to be perfectly squared and oriented by the cardinal points, with a height of 60 meters and a base of 8,000 square meters. The Portuguese Hydrographic Institute of the Navy currently has the job of analyzing the data to determine whether or not the structure is man-made, which seems to be a moot point once you see the building. The pyramid was found in an area of the mid-Atlantic that has been underwater for about 20,000 years. Considering this is around the time of the last ice age where glaciation was melting from its peak 2,000 years prior, whatever civilization, human or not, that was around before the ice age, could be responsible for building the pyramid. Certainly NOAA, who studies volcanic activity in the area of the pyramid, would have discovered the pyramid through sonar imaging and so forth since the area is heavily studied due to volcanic activity. With continuing discoveries of new pyramids, on land (the Bosnian Pyramids) or under the ocean, we are forever confronted with the fact that the timetable of what we have come to know as our history, keeps changing with each new find. The question remains—how was such knowledge of these ancient civilizations ever lost in the first place and what can they tell us of our own future?